An old finding aid regarding general information on incarceration and persecution sites of the Nazi Regime was published on the EHRI portal in May 2016. The physical finding aid – a card index – had been gradually compiled between the years 1970 and 1982 and had served primarily as a search tool for ITS staff members. The German Research Foundation (Deutsche Forschungsgemeinschaft – DFG) supported the preparation of the information as an online finding aid. This collection was created to help close considerable gaps in the documentation of camp histories. The “General Documents” collection was used as a basis for evaluation and ground work for other ITS departments. The documents contained in this collection either originated directly from National Socialist authorities and organizations or were created and compiled by the Allies and humanitarian aid organizations after liberation. Documents added later were received from administrative offices (e.g. the Central Office of the State Justice Administration in Ludwigsburg), private institutions, archives (e.g. Federal Archives and the Institute of Contemporary History), individual persons, and through specific document acquisition carried out by staff members of the ITS until 2006. 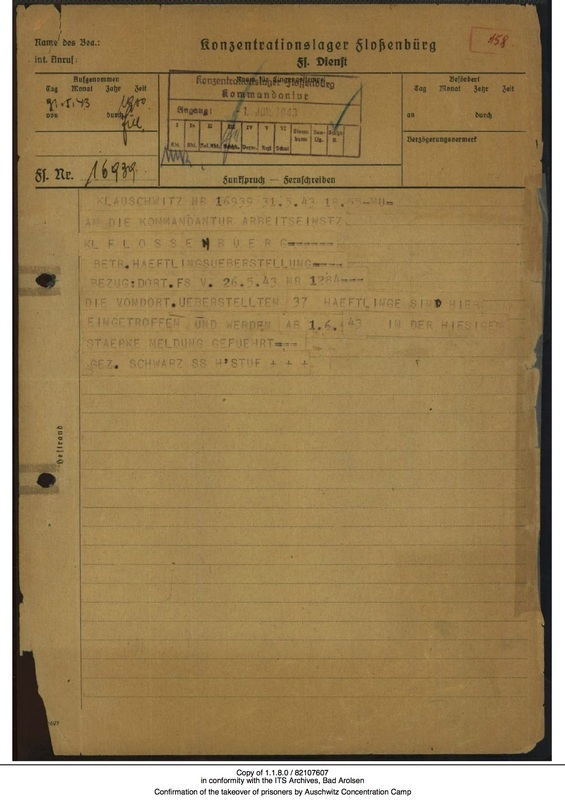 The “General Documents” collection includes correspondence, decrees and orders from the Reich Security Main Office (RSHA) and the SS Economic and Administrative Main Office (SS-WVHA), general and statistic commands and orders from individual concentration camps. There are also reports on the conditions in the prison camps and on witnesses’ fates, collected by attorneys after the war. The physical “General Documents” collection does not have a systematic arrangement. Considering that the ITS made use of the collection to reply to inquiries, the documents had to be rendered accessible. In serving the needs of the International Tracing Service, the German-language finding aid, with its thorough descriptions of documents ranging from individual documents to bundles, offers four topic-oriented introductions – subject file, filing location file, issuer and provenance file as well as an addressee file. The subject file is structured by a multilevel classification on the frame topics Concentration Camps, SS-Construction Brigades, SS-Iron Construction Brigades, Extermination Camps, Youth Protection Camps, Police Detention Camps under the command of the security police, Slave-Labor Camps for Jews, Ghettos and a chronological index. The index cards themselves as well as the digitized finding aid offer a view into the work of a Tracing Bureau (ITS) and its need for background information. The finding aid describes the content of 640 boxes of the “General Documents” collection. By 2006, the year when ITS finished its program of acquiring documents, the collection had risen to an amount of 1,820 boxes. Between 2009 and 2011 ITS holdings were restructured and different parts of the “General Documents” were incorporated into the corresponding Concentration Camp Collection. Furthermore, the collection was digitized and its digital reproduction made available to ITS visitors through the institution’s digital database system. 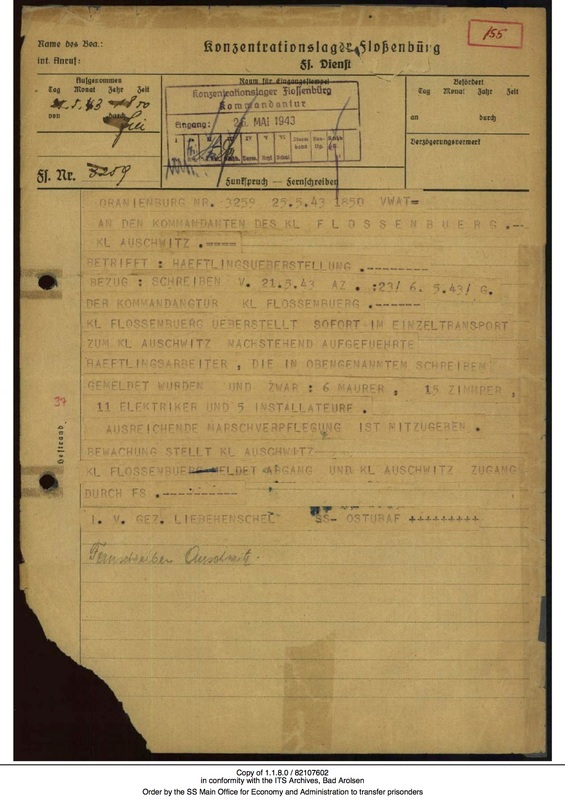 The variety of subjects covered in the “General Documents” collection is highlighted by explanatory documents below regarding the organization in concentration camps. Order by the SS Main Office for Economy and Administration to transfer prisoners, 1943, 1.1.8.0/ 82107602/ ITS Digital Archive. Arthur Liebehenschel, head of D 1 division – the central office of the SS-WVHA – issued an order to transfer 37 skilled workers from “KL” Flossenbürg to “KL” Auschwitz. The telex dated May 25th, 1943 dryly orders that 37 prisoners, named in a related letter, are to be supplied with sufficient provisions for the transport, which is to be guarded by “KL” Auschwitz staff members. Liebehenschel requests that the SS-WVHA to be informed at the departure from Flossenbürg and arrival at Auschwitz. The index card 006/0419a.jpg references to this document written in dry bureaucratic language, which is an original preserved by the International Tracing Service (Doc.-ID: 82107602). Confirmation of the takeover of prisoners in Auschwitz Concentration Camp, 1943, 1.1.8.0/ 82107607/ ITS Digital Archive. On May 31st, 1943 Heinrich Schwarz, head of the labor detail division within Auschwitz main camp, reported to “KL” Flossenbürg´s labor detail command that the 37 prisoners sent from Flossenbürg have arrived. A few short lines dryly state that the prisoners will be included in the official number of inmates as of 1943-06-01. The index card 006/0518a.jpg refers to this document, which is also an original preserved by the ITS (Doc.-ID: 82107607). After World War II, Mrs. H. Grosman interviewed a former inmate of Auschwitz concentration camp, and the Commander of Aschaffenburg DP Camp at that time, Mr. Leopold Zaremba, on numbering systems used in “KL” Auschwitz. Mr. Zaremba talked about the first days of the Camp in 1940. At that time, the first German prisoners became Kapos and Blockleaders. He describes in detail the different groups registered in Auschwitz. Furthermore he counts the murdered. This general report covers the complete time span of the camp´s operation, concluding with the last stages of the death marches in Dachau-Tölz. The index card 006/0131a.jpg refers to this undated report, which, too, is an original preserved by the International Tracing Service (Doc.-IDs: 82345923, 82345924). Registration of prisoners in Auschwitz Concentration Camp, undated, 1.1.2.0/ 82345923, 82345924/ ITS Digital Archive. Leopold Zaremba’s fate is also documented in the ITS’ collections. His full name is probably Leopold Zaremba-Hermann. This information is documented in an “Enquirer´s request” filled by Mr. Zaremba after the war. Mr. Zaremba was a Polish national born 1913 in Sarny, Poland. He was incarcerated in “KL” Auschwitz for political reasons as of 1943. In January 1945 Mr. Zaremba was transferred to “KL” Groß Rosen, then, in February 1945 to “KL” Flossenbürg and finally in April 1945 to “KL” Dachau. He was liberated in Dachau on April 29th, 1945 by the US army. The ITS records confirm that Zaremba registered as a Displaced Person in Aschaffenburg. He was transferred to Wildflecken on October 25th, 1946. Mr. Zaremba emigrated to Canada onboard the R.M.S. Samaria on November 23rd, 1948. These examples shed light on two characteristics of the finding aid: first, the full display of the documents’ contents, second, the authenticity of the different types of documents in the ITS resulting from document acquisition. Users of the ITS archives ask for subject-related descriptions of the ITS holdings to find answers to their research questions. The documents make the ITS holdings a unique source of information on topics concerning the Holocaust and Displaced Persons. This digital finding aid has several advantages compared with the original physical card index. To answer a variety of different questions e.g. by full text research, one only needs a single entry to the information held in this finding aid instead of the four ones mentioned in the text above. The digitized finding aid can be accessed from anywhere, and doesn’t require the user to visit the ITS in person. Furthermore within EHRI-portal you can search though all ITS’ collections as well as all collections described in this portal. To provide access to this exceptional source of information the ITS retro-converted this finding aid with the support of the German Research Foundation (DFG) and published it on the EHRI portal in May 2016.